At Lanes Outdoor Equipment Inc., we focus on selling and servicing product that will help our customers cut grass efficiently and profitably. Since 1969 we have built an excellent reputation in our area as the "only place to buy power equipment for the Landscape Professional". We have highly skilled personnel that will do everything possible to make you a lifelong customer. If you have any questions please feel free to contact us, we're always glad to help! Lanes Outdoor Equipment Inc. is proud to be an authorized dealer of Scag Power Equipment. 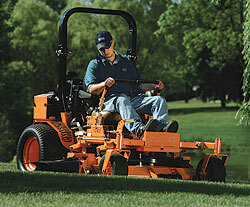 We also carry a complete line of other equipment such as Husqvarna, Echo, Grasshopper, Exmark and more. Please call us at (850)638-4364/7980 to arrange for a demo or stop by our store to see our top quality line of equipment, guaranteed to make your job easier. SPRING IS JUST AROUND THE CORNER, TIME TO GET STARTED!! LOTS OF NEW THINGS TO SEE FROM OUR BROAD RANGE OF EQUIPMENT MANUFACTURES, NEW MODELS, NEW ENGINES, NEW PRODUCTS!! !